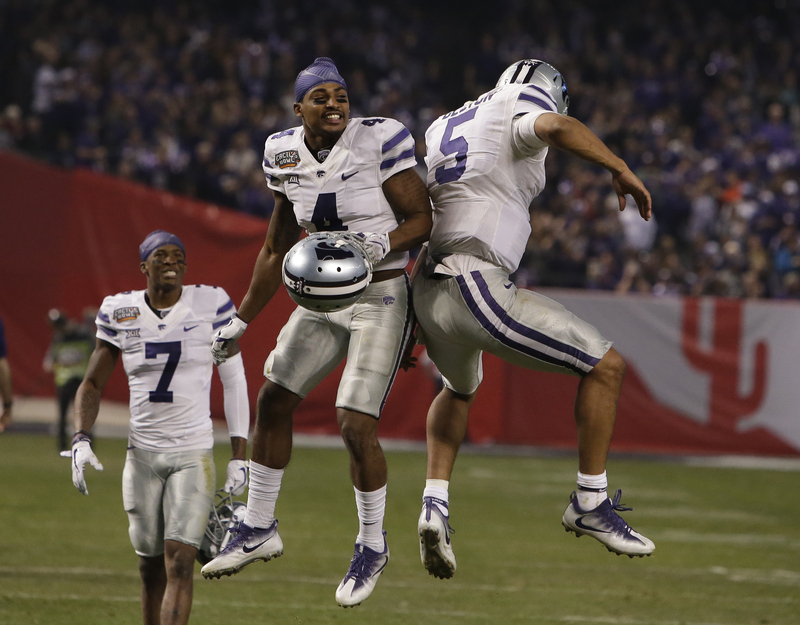 Kansas State’s 2017 season came to a fitting conclusion in Phoenix as Tuesday night’s Cactus Bowl win over UCLA represented a microcosm of the last three months. Let’s break it down. 1. The Wizard still has a little magic left. At halftime, more than a few K-State fans headed to bed. I don’t totally blame them. The Wildcats weren’t only trailing by 10; they were doing all the things that drove those same fans nuts: Throwing the ball against a bad rush defense, calling weird timeouts, and giving up a lot of passing yardage. But Bill Snyder and his staff adjusted, and the second half was as well-coached as any half of football K-State played this year. The ground game was prioritized, which made things easier on the defense. 2. Alex Delton is determined to make spring ball interesting at the QB position. Most fans, myself included, were assuming Skylar Thompson had officially taken over as K-State’s quarterback of the future. I still believe he will be, but Delton’s performance against UCLA (and his performance this season as a whole) will keep him in contention for the starting job in 2018. Thompson is the more talented player and has a higher ceiling. But Delton has something going for him, too — his skill set is a better fit for the Wildcats’ brand of offense. That brand, by the way, could change as K-State replaces Dana Dimel. So we don’t really know how important Delton’s edge is there. But how often does a non-senior quarterback get named MVP of a bowl game and then not start the following season? 3. Dalton Risner is coming back. Risner was a Second Team All-American this season. He’s undoubtedly the glue of the offense, even if the team didn’t need him to beat UCLA. After the game, he announced on Twitter he will return next season. That isn’t shocking news, but it does confirm K-State will have one of the most experienced offenses in the country next year. The Wildcats’ new offensive coordinator, whoever it is, will have a lot of toys to play with. 1. The halftime adjustments shouldn’t have been necessary. While K-State’s ground game took UCLA behind the woodshed in the second half, the fact it took so long to establish Barnes and Delton is puzzling. It was no secret that the Bruins’ rush defense was awful this year. Skylar Thompson throwing the ball seven times on K-State’s first four drives is three or four times too many, even for someone with his arm talent. One wonders if K-State could have won this game by 30 had the Wildcats pounded the ball for all four quarters. 2. Bill Snyder’s future remains a mystery. Whether you want Snyder to return next season or not isn’t the focus here. That’s a different conversation. But the 78-year-old legend remaining mum on his decision, one way or the other, keeps K-State in a limbo that can really hurt with recruiting and with the fan base. I didn’t expect Snyder to have a definitive answer last night. It would have been out of character for him to make that kind of announcement right after a game, before he can sleep on it or talk to his family. But I do hope we get one in days rather than weeks or months. 3. K-State’s defense has a lot more to replace than originally thought. Time will tell on D.J. Reed’s decision. He would likely get drafted if he left school now, but he’s a player who could improve his stock by returning next year. And Reed isn’t even the player I’m really talking about on this one. Jayd Kirby, for all the criticism he took early in the season, became a really solid linebacker for the Wildcats in 2017. He led the team in tackles this year with 99 and tied for a team-high in the Cactus Bowl. He will be missed to a much higher degree than I would have thought. Oh yeah, and K-State is also losing Will Geary and Trent Tanking. The Wildcats need to be better on defense next year, and it won’t be an easy task.